Here is an autumn visual closure and visual motor activity to download from Your Therapy Source. Draw a line connecting the enlarged picture to the complete picture. Download the Autumn Close Up Activity. This download is a collection of visual perceptual worksheets with a Fall theme. 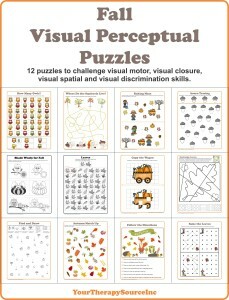 Practice visual motor, visual discrimination, visual spatial, visual closure and overall visual perceptual skills with these worksheets.Print off multiple copies for your students, staple the packet together and your activities are ready to go! FIND OUT MORE.